So I’ve recently begun watching The Expanse. I’ve not read anything about the show yet and just got through maybe the first have of season 1. While I have no love for the characters (yet at least), I am impressed by the worldbuilding. I love the setting. There are so many details that they pick out and show you that I love. The fact that there are rats on spaceships, the degeneration of health among the Belters due to low-gravity and scarce clean air and resources that has had the knock on effect of generational divergence from “Earther’s”. The working-class Belters are asteroid miners who dwell on the stations on Jovian and Saturnian moons and the ships that harvest precious water from ice asteroids for Earth/Mars corporations. The Belters are given a unique culture. Maybe I feel a kinship with the Belters because of my own cultural history, especially with the fact they have their own distinct languages and expressions unknown to the more privileged Earthers, it’s nothing new to sci-fi but I find the precariousness of it pulling me back for more. Good job on creating tension with just the setting. 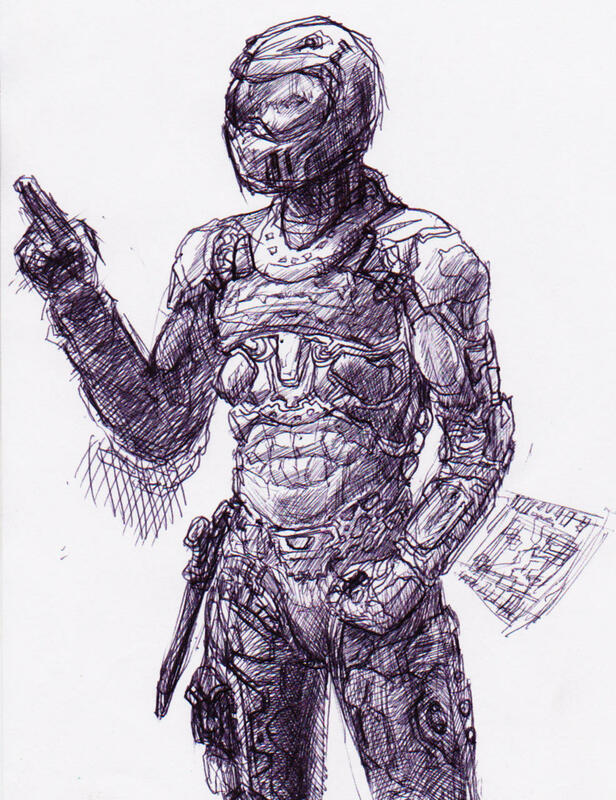 I thought I’d share this little ballpoint sketch from some point between episodes, something to chuck up here anyway. His chestplate reminds me of the weird dragon plant on the cover of Mastodon’s Once More Around The Sun. Not a bad thing!